AutoGas fleets experience fuel cost savings. You can cut your operating and fuel costs substantially by converting your existing fleet vehicles to AutoGas. 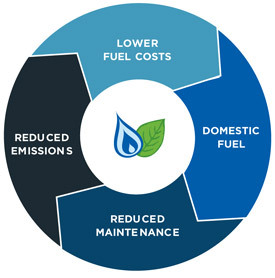 While using AutoGas we have seen some savings up to $1.50 or more per gallon than gasoline and the implementation costs are significantly less than for other alternative fuel options. With propane AutoGas we can procure the product in advance and Sharp Energy offers fixed pricing if requested. 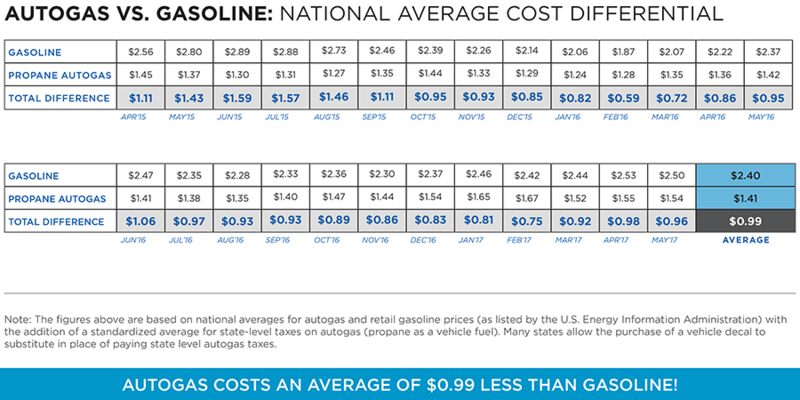 Historically, propane AutoGas costs less than gasoline or diesel and is more insulated from the price spikes conventional fuels experience. Click here to calculate your fuel cost savings. The cost of conversion is dependent upon the type of vehicle being converted (car, van or truck) and the number of vehicles in the fleet. Through Sharp’s’ partnership with Alliance AutoGas, gasoline-to-AutoGas conversion costs approximately $6,000-7,000 per vehicle. Converting a vehicle to run on propane AutoGas is much less expensive than other alternative fuel conversion costs or the purchase of a new hybrid or alternative fuel vehicle. The cost of infrastructure implementation is lower; 15 AutoGas stations can be built for the price of one CNG station. Tank size within a vehicle can be much smaller; so, AutoGas vehicles achieve 85% of the range of gasoline vehicles, while CNG vehicles get less than half the range of gasoline vehicles.